Still, have you ever wondered how this copious horn came to be? There are two historically understood origins of the cornucopia, and both come from Greek mythology. The first involves a feud between the renowned he-man, Hercules and the river-god, Achelous, the greatest river in Greece. The two were suitors for Dejanira, a young maiden of extraordinary beauty who was the daughter of King Oeneus of Calydon. The competition (the legendary Fifth Labor of Hercules) amounted to a colossal wrestling match, during which Hercules repeatedly gained the upper hand. Achelous, who was able to change his physical form, changed first into a snake, and then into a bull in order to gain leverage against Hercules. While Achelous was in bull form, Hercules tore off one of his horns and in doing so, diverted the river. The Naiads (nubile water-nymphs) treated the horn as a sacred object, filling it with fragrant flowers. The Goddess of Plenty (Copia) later adopted the horn, and dubbed it (appropriately enough) The Horn of Plenty, or Cornucopia. Incidentally, Hercules later married Dejanira and the two produced an abundance of children. Ancient peoples were fond of uncovering hidden meanings in their mythological tales. The battle between Achelous and Hercules is explained by saying Achelous was a river that overflowed its banks during rainy seasons. When the fable says that Achelous loved Dejanira, and sought marriage with her, the interpreted meaning was that the river flowed in its winding path through part of Dejanira’s kingdom. It was said to take the form of a snake, because of its serpentine course and that of a bull, because of the guttural roaring sound it made as it flowed. When the river swelled, it created itself another channel. Thus its head was horned. Hercules prevented these periodic overflows by building embankments and canals; therefore he was said to have vanquished the river-god Achelous and cut off his horn. Finally, the lands – formerly subject to overflow – became very fertile, and this is what’s meant by the horn of plenty. The second and less complicated version of the cornucopia’s origin is actually older than the first, and involves Zeus, the greatest of all the gods. When Zeus was born, his mother Rhea sent him to Crete to be cared for, thereby hiding him from his father, Cronus, who would have otherwise eaten him. Melisseus, king of Crete, had several daughters, and they took on the task of raising Zeus. The nurses hung Zeus in a cradle from a tree, so that he could not be found in heaven, nor on earth, nor in the sea. Their she-goat, Amalthea, provided milk for the young god. Zeus eventually broke off one of Amalthea’s horns, and endowed the horn with the wonderful power of becoming filled with whatever its possessor desired. He gave the horn to the King’s daughters as a form of thanks, and from then on, the horn – or cornucopia – became a symbol of plenty and whoever had it in his or her possession would never starve. Mythology was a popular theme in classical paintings, and the cornucopia became a decorative motif, often portrayed as a curved goat’s horn overflowing with fruit and grain. The horn of plenty was regarded as the symbol of inexhaustible riches and plenty; and it became associated with several deities, especially Tyche (Roman name: Fortuna), the goddess of riches and abundance. The cornucopia, depicted with its mouth turned upward as opposed to its modern downward orientation, also became the emblem of Dionysus (Bacchus), Demeter (Ceres), and several others. 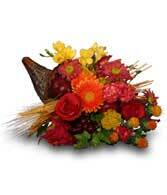 Today, of course, the cornucopia often finds its way to the Thanksgiving table as a centerpiece. Typically, it’s in the form of a woven, slightly curving, conical basket that is filled to overflowing with fresh flowers and/or fruits and vegetables. Many people have such a basket that they bring annually to their local flower shop to be filled anew with a harvest of seasonal products. But if you don’t have a cornucopia of your own already, your local florist probably does (or can easily get one for you with advance notice). A horn of plenty centerpiece looks great with a lush and varied assortment of materials, so along with the fresh flowers, consider adding some dried wheat or cattails to the design. Dark brown lotus pods can add wonderful textural contrast as well. Perhaps a few colorful gourds or miniature pumpkins can be used to add interest. Ask your florist to “be creative” as your centerpiece is designed this year. And remember, if you can’t make it back to the family homestead for Thanksgiving dinner this year, you can always have your local florist send a seasonal floral arrangement anywhere in the country, just to let those folks know that you’re thinking about them. 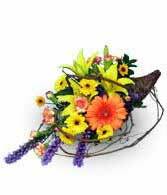 You can even send them a centerpiece of fresh flowers like the ones on this page, abundantly arranged in a cornucopia – a perfect symbol of gratitude for all that we have – including each other. Have a wonderful holiday!